Tiru Lodge - Mabalingwe Nature Reserve Accommodation. 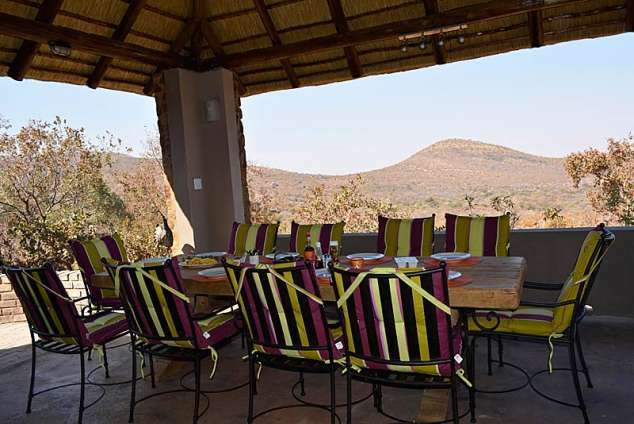 1/20 - Dining table for 10 in Lapa with a view over the bushveld. 2/20 - Jacuzzi under the tree. 3/20 - Relax overlooking the bushveld. 5/20 - Braai facility and fire place. 6/20 - Lapa/Boma with canvas to cater for all conditions. 7/20 - View from the deck. 14/20 - Njala Bull next to Lapa. 15/20 - Warthog family next to house. 19/20 - One of many bird visitors. Tiru is a privately owned lodge situated inside Mabalingwe, a Big 5 game reserve 28 km from Bela Bela and 140 km from Pretoria. Enjoy the ultimate bushveld experience, with the ultimate boma/lapa combination, where you can sit around a boma fire underneath a well designed thatch, with all the facilities next to you, including canvas to control wind flow, build-in braai and large table to socialise around. Sit on the deck and enjoy breath-taking views over the reserve, while animals and birds come very close. Enjoy a Jacuzzi under a tree in the bush or alternatively indoors next to a modern closed combustion efficient fireplace at night if it is cold. The lodge is situated within close proximity of Mabalingwe's recreational facilities, including tennis courts, a mini-golf course, squash courts, swimming pools and a convenience shop, as well as the restaurant, a boma, a bar, hot and cold pools, a Jacuzzi and sauna rooms. Mabalingwe offers an excellent entertainment program which includes a wide range of adventure activities such as guided game viewing, horse riding and lion feeding by prior arrangement. Guests are also allowed to enter the game viewing area with their own vehicles, ensuring that you have maximum time to enjoy the wild and bird life. The lodge sleeps nine people. It has a bedrooms with a king-sized bed and a queen-sized bed, one bedroom with two single beds, three single beds on the upper loft and two bathrooms. The rooms are air-conditioned. The kitchen is fully equipped with an oven, microwave oven, a large fridge-freezer, ice machine and a dishwasher. TV: Flat screen with full DStv and video player. 18901 page views since 23 May, 2014.